When I buy things I like to do a lot of research ahead of time but I also like to handle things in person. Unfortunately buying a bike in the fall meant I needed some lighting to minimize the drunks and distracted drivers best efforts to kill me why biking. 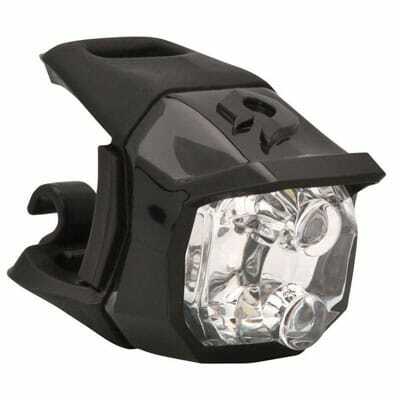 I simply did not have the luxury to shop the local bike shops for my lighting needs. I was forced to rely on reviews at online stores and feedback on the various cycling forums. The first light I set out to buy was a front light. I was not looking for a light to light my way but instead get a light so I can be noticed or targeted depending on your point of view. Well after about an hour of research it became clear that one of the best choices was the Blackburn Voyager Click Front Light. Fortunately the Blackburn Voyager Click Front Light is so inexpensive at about $15 dollars or less I had basically nothing to lose so I ordered one. About three days later the mailman delivered the Blackburn Voyager Click Front Light and several other goodies that we will discuss elsewhere. Upon removing the light from it’s packaging I was struck with a memory from my youth. The Blackburn Voyager Click Front Light looked very much like a ring I received in a box of cracker jacks about 40 years earlier. Though the ring was smaller and green it was also rumored to give me the powers of Green Lantern. Anyhow the Blackburn Voyager Click Front Light was ready to go right out of the box. All that needed to be done was to locate a suitable mounting location on the handlebars and secure it with the included rubber bungee cord. At first power up or shall I say first click I was pretty impressed (and blinded) by how bright these little LED’s are. While I am not typically a fan of LED’s beyond their low power consumption as I find them overly bright without providing any useful light. I find them pretty annoying actually. However in the case of needing a light to get me noticed while cycling everything I despise about LED’s is a benefit. Moving on the second click was shocking. The Blackburn Voyager Click Front Light flashes like a strobe light from your favorite night time hot spot. It gives the sense of being brighter than the always on position. Not sure if the strobe setting is brighter or it’s just the contrast from on to off that appears to make it seem brighter. I have had the Blackburn Voyager Click Front Light installed for several weeks now and I am still here to update this blog. So I guess I can say without a doubt that if you want to be seen in the dark this is an absolutely perfect investment for your safety. In fact because of how well it works and how little it costs I can see adding more than one to a bike. It’s also worth noting I think the Blackburn Voyager Click Front Light would work well on folks walking at or near dark, as well as dog’s and their leashes.